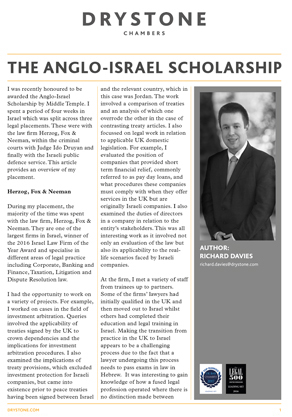 Richard Davies was recently selected by Middle Temple to take a scholarship in Israel and describes his experience in the following article. Richard enjoyed a placement in a private practice law firm as well as seeing the other side of the legal market by also working with their Public Defence Service and within the Courts. In this article Richard describes this experience, drawing on his knowledge of the English legal system to compare and contrast against the Israeli system. Richard has developed a broad criminal, regulatory and extradition practice. He is regularly instructed in crown court defence cases where he has dealt previously with such matters at trial as inter alia conspiracy to burgle, sexual assault, affray, fraud, PWITS and money laundering. He has also obtained several certificates for counsel for youth court matters. Richard acts at full extradition hearings and has drafted successful grounds for permission to appeal. He prosecutes housing matters for local councils and has also undertaken drafting work for the Government Legal Service. He is direct access and CPS grade one qualified. Click here to view Richard’s profile in full.